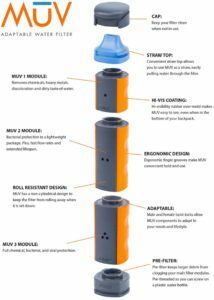 I’ve tried out plenty of water filters for Outdoor Sports Guide, but was intrigued by the new MUV water filter launching today on Kickstarter because of its modular design that makes it versatile for everyday and backcountry use. Utah-based Renovo Water launched a similar Kickstarter last year, but decided to re-tool and redesign the filter to create something even better than their first iteration, and the time and energy paid off. The new filter is sleeker, simpler, and easier to carry than the previous design, making it better for backpacking, camping, etc. Renovo Water’s team spent three years developing, designing, and testing before launching this campaign, and what I love is that you can have one filter for daily drinking in a water bottle, but you can also drink straight from the stream with it, or attach it to a water bladder. Learn more about MUV’s innovative, adaptable water filter technology here. I’m a Kickstarter-holic and a lover of buying local, so I’ll be purchasing a filter ASAP. The only thing I’m sad about is it won’t come until the end of the year! 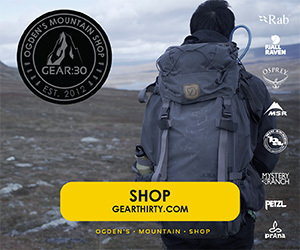 As for the campaign gifts, I like the Early Bird offerings for saving cash with my favorite for outdoorsy folks like me being the Survivalist model, which includes a MUV 1 Activated Carbon Module + MUV 2 Hollow Fiber Module + MUV 3 Nanalum Module + (2) In-line Hose Connectors + Mouthpiece and Cap for just $45 instead of the retail $69…until they run out. What do you think of MUV? Which one would you get? Let us know in the comments.